Home/Dinosaur and Prehistoric Animal News Stories, Dinosaur Fans/Dastardly Daspletosaurus a Cannibal? Palaeontologists have been aware for some time of a growing body of evidence to suggest that a number of different types of Theropod dinosaur engaged in intraspecific combat, that is, one member of a species fights with another member of the same species. Pathology preserved on skull and jaw bones has been found in a number of different types of meat-eating dinosaur to suggest that activities such as facial biting could have been common place. These face bites could have been part of some form of ritual combat, perhaps over pack status or perhaps the bites resulted due to competition over mates (or they may have even been inflicted during mating). A research paper published in the on line academic journal PeerJ, provides further evidence of facial injury, this time the evidence suggests that some of the wounds were premortem, they occurred whilst this dinosaur lived, the other wounds indicate that a large meat-eating dinosaur scavenged the carcase. The fossils of a Daspletosaurus recovered from the Dinosaur Provincial Park (Alberta, Canada) reveal a rather gruesome story. This dinosaur suffered from a serious of facial bites whilst it was alive, when it was dead its body was fed upon by another dinosaur. Could this be evidence of cannibalism in the Dinosauria? Daspletosaurus was a large tyrannosaurid, whose fossils have been found in Alberta and the western United States. It lived several million years before its more famous relative Tyrannosaurus rex. Established as a distinct genus in 1970, this stocky, robust carnivore, may have reached lengths in excess of nine metres and weighed as much as an Indian elephant. A number of specimens of Daspletosaurus have been associated with facial injuries. This particular specimen that consists of a mostly complete but disarticulated skull, vertebrae, ribs including gastralia (belly ribs) and some wonderfully well-preserved tail bones, was discovered in 1994. The corpse seems to have been transported in a slow moving river system (low energy environment). Other parts of the skeleton may have originally been present but these probably were eroded away prior to excavation. A partial femur was also recovered but this has been crushed and distorted. The authors of the scientific paper Dr. David Hone (School of Biological and Chemical Sciences, University of London) and Darren Tanke, an expert in vertebrate fossil preparation at the Royal Tyrrell Museum (Drumheller, Alberta, Canada), consider the thigh bone to have been crushed not long after the animal died, i.e. the damage occurred in the Late Cretaceous. They conclude this as much more delicate and thinner skull bones show no damage at all. The skull and mandible of the dinosaur shows facial injuries. Note the illustrator, the very talented Luis Rey, has chosen to represent Daspletosaurus as a feathered dinosaur. Based on an analysis of other Daspletosaurus material, the researchers estimate that this dinosaur was not fully grown when it died. It was probably around ten years of age, measured 5.8 metres and weighed more than half a tonne. This dinosaur suffered a number of injuries, one dorsal rib shows evidence of a fracture but this was well healed by the time the animal died. It is the skull and the jaws that show most signs of pathology. Not all the injuries to the skull came from bites, but there is plenty of evidence preserved on the bones to indicate that this dinosaur lived a tough life and that it had its face bitten on numerous occasions. Many of the bite marks do match the tell-tale shape of puncture wounds from Tyrannosaur teeth, including one particularly savage bite that left a considerable tooth-shaped hole in the back of the skull. Evidence of premortem injury (left lateral view). The picture above shows a digital image of the premaxilla, maxilla and other skull bones with the arrows indicating different injuries that were sustained. A. = A bite to the tip of the snout leaving a sub-circular depression with a diameter of 13 mm and a depth of 6 mm. B. = A lesion in the bone that resembles a tyrannosaurid bite and drag mark. Lesion is 22 mm long and at its widest 8 mm, maximum depth 1.5 mm. C. = Comma shaped potential bite and drag mark on the maxilla which is 22.5 mm long and about 6.5 mm wide at its maximum width. E. = A puncture wound on the left nasal bone approximately 9 mm radius and 2 mm deep. Most likely caused by a bite. All these lesions show signs of healing so they are regarded as premortem. 2. = The base of the left maxilla is broken and these breaks can be aligned with the left lacrimal bone. This damage could have been caused either when this animal was alive or as a result of feeding postmortem, or perhaps by trampling or transport by water to the final resting place of the carcase. This damage is treated conservatively by the authors and regarded as indeterminate, not being classed either as premortem or postmortem damage. The right surangular bone (rear most portion of the jaw that abuts the dentary and sits above the angular bone), also shows signs of premortem damage. There are a number of lesions and patches of osteomyeltic bone (bone which shows signs of infection). This pathology also supports the hypothesis that the Daspletosaurus suffered a series of facial injuries when the animal was alive. The red arrow in the picture shows the roughened bone area that indicates a lesion. Below this lesion a lighter (light grey) area can be seen, this is almost circular in shape. This is damage to the fossil that was probably caused by the excavation process. The scientists also point out evidence of postmortem damage to the specimen. This damage is defined based on the lack of any indications of healing (swelling, reactive bone). There are a series of tooth marks with one set of bite-marks found on the medial side of the right dentary (inside of the bone facing the tongue). A number of other elements have been noted that show possible signs of biting which indicate feeding on the carcase. The spaces between the tooth marks suggest that a large Theropod made these marks, probably scavenging on the carcase prior to its burial. Evidence of scavenging on the carcase. The picture above shows the rear part of the dentary, the medial side of the lower jaw bone (side facing the inside of the mouth). The white arrow indicates a near vertical break in the bone, whilst the black arrows highlight damage to the surface of the bone caused by teeth from a large dinosaur. Other predators were present in the Dinosaur Provincial Park ecosystem, indeed alongside the Daspletosaurus remains, the scientists uncovered a couple of bones (tibia and phalanx) from a small Theropod, along with teeth from crocodilians and a tooth from Champsosaur (long-snouted, reptile that probably ate fish). The tooth marks are quite widely spaced up to two centimetres apart. This spacing rules out a crocodile scavenging on the carcase as the crocodilian fauna associated with the Dinosaur Park Formation are all relatively small. The research team conclude that only a large Tyrannosaur could have left such trace fossils in the specimen. But does the evidence of feeding on the carcase indicate a case of cannibalism? The authors are careful to state that this probably is not a case of one large Tyrannosaur hunting and killing a smaller Tyrannosaur – a predator/prey relationship. Instead, the term “late stage carcase consumption” is used. It is unusual for feeding evidence to be found on the skull and jaws, these areas would not have had a lot of flesh on them. 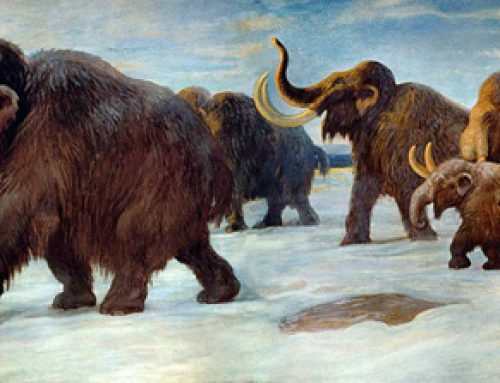 It can be speculated that much of the carcase had already been buried when a carnivore found the skull and jaw bones and fed upon them. This unfortunate sub-adult Daspletosaurus could have been scavenged by a member of its own species. However, another potential scavenger also co-existed with the Daspletosaurs. A second type of Tyrannosaur, Gorgosaurus, lived at the same as Daspletosaurus and as this predator reached lengths of around nine metres or so, it would have been more than capable of chomping the bones of the fallen Daspletosaurus. It is not possible to determine whether a passing Gorgosaurus fed on the corpse or whether this is a case of Daspletosaurus cannibalism. There have been a number of papers published on the face biting phenomenon in Theropod dinosaurs. Everything Dinosaur team members recently reviewed data published on Monolophosaurus from the Middle Jurassic of China, a Megalosaur, which also shows evidence of intraspecific combat (face biting). CollectA have made a super Daspletosaurus dinosaur model, no evidence of face biting, but none the less a fantastic dinosaur replica.